'Print-at-Home'® is the most convenient way of receiving your tickets. When you select 'Print-at-Home'® as your delivery method during purchase, you'll receive an email with a link to your ticket(s). Not only will you get your tickets right away, but you can print them out anytime before the event. Skip queues. No more waiting for mail delivery or pickup lines for tickets. Get to the venue, present your 'Print-at-Home'® ticket and enjoy the show. Q. How does 'Print-at-Home'® work? Choose 'Print-at-Home'® as your delivery method. We'll email you a link to your ticket(s). To access your ticket(s) simply log into your My Ticketmaster account. To print your tickets, click the View & Print Button on the My Order Detail page. All you need is Adobe Acrobat Reader 5.0 or higher (available free). At the venue, your tickets will be scanned at the gate for entry into the event. Enjoy. Q. Are there benefits to choosing 'Print-at-Home'®? You print them out anytime. No more worrying about misplacing your tickets. Q. Which email from Ticketmaster contains my 'Print-at-Home'® tickets? A. You will recieve one confirmation email with a link to your ticket(s). Your 'Print-at-Home'® tickets will be available for web pickup by logging into your My Ticketmaster account on Ticketmaster.co.nz. Q. Do I need any special hardware or software to use 'Print-at-Home'®? Printer - Any ink-jet or laser printer (color or black &white) with a resolution of 300 dpi or more is able to print 'Print-at-Home'® tickets. Use A4 size plain white paper for best results. (If you're unsure of your printer's resolution/dpi, check the printer manual). Adobe Acrobat Reader 5.0 or higher. If you do not have it, download it now for free. A. Yes. The ticket that is printed through your printer is a valid, legitimate ticket. Make sure you keep it in a safe place like you would cash, and protect it just like you would any other ticket. Click here to see what your printed 'Print-at-Home'® ticket should look like. A. Only the first scan of the barcode on your ticket will be allowed entry. 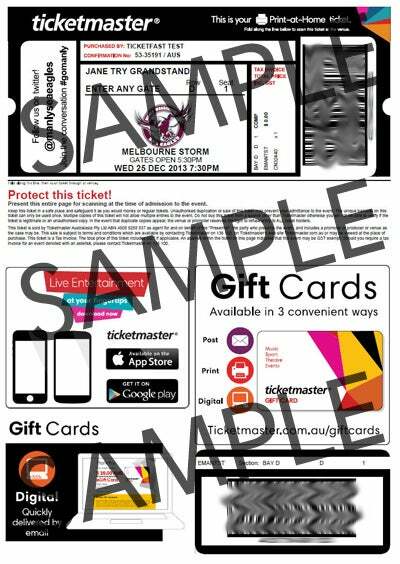 Make sure you keep the printed ticket in a safe place like you would cash, and protect it just like you would any other ticket. If more than one copy were to arrive, the barcode scanner will alert the attendant that the ticket has already been scanned. If there is a dispute, the purchaser's name and the last four-digits of the credit card used to make the purchase is on each ticket. Q. Why isn't 'Print-at-Home'® available for all events? A. Only venues with the appropriate scanning equipment can offer 'Print-at-Home'®. We are working on increasing venue and event participation, and availability is increasing every day. Q. What if I cannot print my tickets? A. Check to make sure you have Adobe Acrobat Reader 5.0 (Free) or higher.